“90 Day Fiance” Stars Colt Johnson & Larissa Dos Santos Limas Have Reached a Divorce Settlement: Get Details! Larissa Dos Santos Limas and Colt Johnson have finally agreed on something! Starcasm reports that the estranged 90 Day Fiance couple settled their divorce terms on Monday, prior to their scheduled case management conference. Although Larissa was previously asking for a variety of things, including $1,000/month in spousal support, half of the couple’s bank account sums and half of all home furnishings, it appears that she has given up at least some of those requests. In a statement to E! News on Monday, Colt’s lawyer confirmed that the couple will no longer need to to go to court. She also confirmed that the couple managed to refrain from clawing each other’s faces off during their negotiations. “[The] matter was settled amicably between the parties and each party will walk away and bear their own costs and fees,” she stated. A judge was also due to rule on the gag order that was in affect (to keep Colt from discussing the divorce in the media or on social media). “The motion for temporary orders and gag order was vacated today by agreement of the attorneys in anticipation of submitting the final settlement and order to the judge,” Shawanna stated. 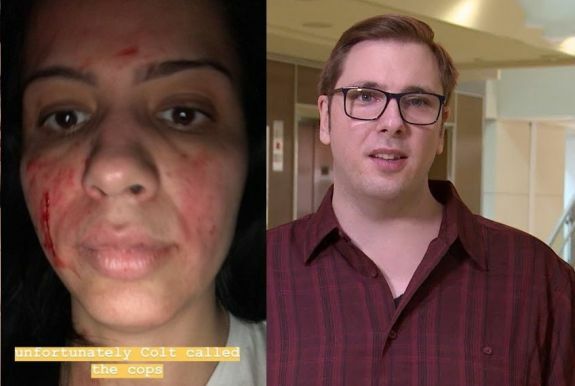 As The Ashley previously reported, Colt filed for divorce from Larissa in January, immediately following a physical altercation that left both bloody and Larissa being hauled off to jail. That incident was the third for the couple in a period of eight months. Larissa was arrested all three times, but the charges for the first two arrests were dropped. She is set to go to trial next month to face the domestic battery charges against her for the third incident. After Colt filed for divorce, Larissa asked for spousal support in her response to Colt’s filing. However, Colt’s lawyer seems to think there’s little to no chance of Larissa getting any money from Colt. In fact, she believes that Larissa should be coughing up the cash to Colt! “To the extent Larissa is seeking any support, SHE should be the one to pay Colt,” Colt’s attorney told E! News. “She has battered Colt three times during the 9-month marriage, and has gone to jail three times on assault charges. She has posted pictures of her face online to try to garner sympathy and paint Colt as the aggressor. However, he was never arrested or charged, and the police rightly believed that he was the victim, not Larissa. “The equities lie with Colt, and this is one of the factors the Court can take into account when setting support (if any),” she continued. Yesterday was one year of my arrival in the United States, thank you @realitydiggers for remembering me! !I learned a lot in the past one year, made mistakes but in the end I'm just grateful for everything. 90 day fiancé was a great experience, I love that I connect with people that always support me as a @faith7558 @tee_realiteee @realitydiggers @juliadickson47 @faith7558 @johnyates327 @force_of_echo and much more, I can't just mention one but they know how much I care I never forgot that my "dream" was juts do to CVS and buy Maybelline or visit Walmart 🤣 Well, now my dream is a biggie house with a pool, thankfully I'll get it with my own strength. Larissa and Colt are due to appear on the upcoming fourth season of 90 Day Fiance: Happily Ever After? which will likely cover their altercation(s), divorce and court battles. The new season will not include footage of Larissa’s criminal trial; however, due to the judge in the case recently revoking any and all media access to the courtroom. Sounds to me like she’s trying to get a gig with CVS or Maybelline or Wal-Mart. still not understanding why she gets to stay in this country. And who is responsible for her? When you apply for a K1 visa you “Sponsor” them, promise to be financially responsible for them for the next 10 years. If they encure hospital bills or need government assistance the “sponsor” has to pay. Do you mean green card? Luis never got his green card during his marriage to Molly. He did marry someone else so maybe he got some kind of visa through that wife. I read that he received the visa (those are the words they used in the article) actually i think it was Molly on TV, during the divorce she talked to an attorney & since the visa was already processed she could be responsible. Remember he talked her into signing the marriage license as soon as he got here, they never even had a wedding but courts only care about the license. Because it’s better for Cole to let things go. So he is not going to get that green card revoked or anything. Probably financial reasons or/ and he didn’t tell the whole truth. So for a fiancé visa you use the financial form 134 this is non binding once they enter the country on the visa. A fiancé visa is just to enter the country, marry, and then to be able to apply to adjust status to get a green card it does not give a green card in itself. Adjustment of status to get a green card can only be done with the original petitioner of the fiance visa and only after they marry, this adjustment of status requires the 864 financial form which is binding for ten years of work (40 quarters) or the person gives up their green card or they get citizenship or they die. If he pulled the 864 form before she got her green card then the application to adjust the status to get the green card will be denied. There are precedent for those who divorce but the ex still supports the 864 to be able to go ahead with adjustment of status but this is rare, she cannot simply have someone else do the 864 as he as the underlying petitioner has to have one submitted and if he has withdrawn it he prob wouldn’t submit one again for her. There is an interesting theory going round that some on the show don’t actually come in on a fiancé visa but on some kind of work visa and that’s how they have been staying post divorce.